TWITTER CAN BE A GREAT SOCIAL MEDIA RESOURCE FOR BUILDING AND SUSTAINING BUSINESS MOMENTUM OUT IN THE MARKETPLACE. WE LIKE TWITTER BECAUSE IT'S A QUICK, EASY WAY TO COMMUNICATE WITH OUR CLIENTS AND SUPPORTERS IN A MEANINGFUL WAY, WITH CONTENT THAT WE HOPE IS USEFUL AND VALUABLE TO THEM. WE ALSO FOLLOW A SELECT GROUP OF TWITTER ACCOUNTS--ONES THAT WE THINK HAVE A TOP NOTCH GAME GOING THERE AND LOTS OF GREAT INFORMATION TO SHARE. WE WANTED TO OFFER A FEW OF OUR FAVORITES FOR YOU. WE HOPE YOU LIKE THEM AS MUCH AS WE DO. SXSW has been a successful annual event for 20 years, showcasing the best in emerging music and has expanded to film, art, and other aspects of pop culture. Their Twitter account is an inventive mix of promotional material for the conference and its satellite programs (like their awesome Accelerator event), funny content, and related topics. If you want to stay on top of what's truly hot in the music and pop culture scene, don't miss out on following SXSW. In the past decade, as the blog industry has evolved, so has the blog event landscape--more blog-business events occur each year and BlogHer is one of the best out there. Even though it's relatively new as far as annual conferences go (it started in 2005), it's proved it has staying power. BlogHer's Twitter account is a good mix of industry information, helpful advice, specific event details, and related retweets and advice. If you're looking for some great new female voices to read, BlogHer's Twitter, check out BlogHer's curated features. You may be asking...Seriously? A dog club? Well, yes, considering that this club has been around almost 200 years and has spawned thousands of offshoot events, and even a very funny faux documentary. There's much to be learned from the broad success of this organization, from a professional event perspective. (Watch the movie for what not to do). The annual Westminster Kennel Club Dog Show, which is co-sponsored by the AKC, draws thousands of visitors each year and a wide televised viewership. Even if purebred dogs are not your thing, you get to see a lot of photos of really cute puppies in your Twitter feed (interspersed with other great event content) and we just don't think there's anything wrong with that. What event more epic than the Superbowl? There aren't many. Thousands of screaming fans, a big sporting event, amazing musical talent, the world's best commercials during the breaks, all available to anyone with a television at home, a beer, and a bucket of buffalo wings. 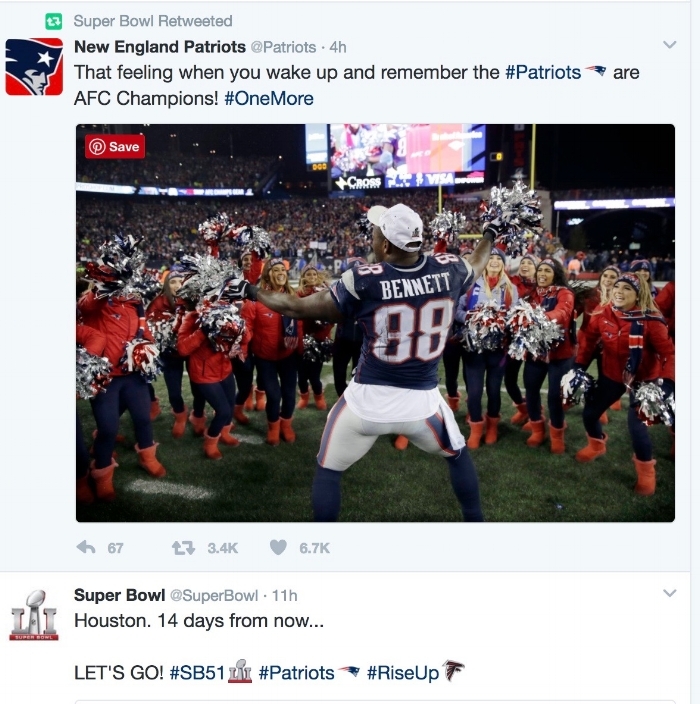 On Twitter, keep abreast of the contenders all in one place, sneak peeks of each year's halftime acts, and see who's hedging the biggest bets on commercials that cost $1 million or more. Touchdown! With some great interactive content (like the tweet pictured above) the Academy's Twitter account offers a great blend of event information, funny tweets (Jimmy Kimmel is host, of the Oscars this year, after all), and industry-related content. This is the place to go if you want to stay up-to-date with the motion picture entertainment industry and big events like the Oscars. (And really, who doesn't want to stay up to date with that?) Start placing your bets now, the nominees will be announced soon. Any person interested in events must be interested in food, since most, if not all, events have food of some kind. The easiest way to stay on top of what's amazing, new, hot, fun and tasty in the food scene is to follow Bon Apetit Magazine on Twitter. Not only will you have glorious food photos in your Twitter feed, you can also stay hip to everything you need to know to make your next event as delicious as can be. Not only is it fun, but these incredibly innovative conferences have an unreal collection of followers (1mil+ each) and you should be one of them. We've written about Comic-Con NYC before, exploring in detail why it's so awesome, and the San Diego franchise is no different. Both of them have stellar, inventive Twitter accounts with sneak peeks, behind-the-scenes, and lots of great content. Don't miss it! Each year since 2012, marketing and sales software company Hubspot, holds its Inbound conference. We love what they are doing and here's why: focusing on business innovation, they gather some of the most intelligent, curious, and brilliant people out there for an amazing annual event. Their Twitter feed is the best way to stay engaged with all of what they are offering, even when the conference is over. Inspiring quotes, great video content, and creative ideas for your own events. Follow them now!